What are the main IPDM issues being focussed on? 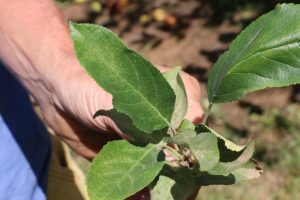 Focus on Woolly Apple Aphid (WAA) and Codling Moth (CM) continued as harvest commenced. Mites also became an issue in the lead-up to harvest and required some attention. What are you doing currently with IPDM? WAA & CM – The start of Harvest in some blocks, gave us another opportunity to closely assess any change in the incidence of WAA and CM infestation. Mites – An IPM service provider was engaged in mid-February to assess our mite and predatory mite populations and determine if any intervention was needed before harvest started. What has worked well? What hasn’t? WAA – Hot spots of Woolly have generally stayed in check and in localised groups of trees. We have been happy to tolerate some infestation in patches and this has enabled us to build numbers of the parasitic wasp Aphelinus mali which we believe is the reason why the aphid population has not exploded or spread widely in the blocks. When we visit the hotspots, it’s easy to see adult A.mali moving around the WAA colonies within the tree canopies. The adult wasps seem to be avoiding the direct sun and can be found in significant numbers on the underside of leaves. There is some shoot and bud damage on a small number of trees in the hotspots. In an ideal world, we would prefer not to see this damage and will be considering strategies for next season that may help us limit this damage in hotspots. Figure 1. 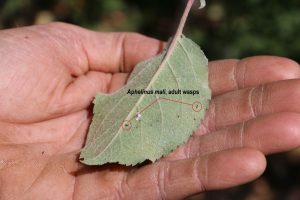 Adult wasps are present in the Tingira Batlow orchard in large numbers and can be readily found on the underside of leaves (Photo: K Dodds). CM – Observations during harvest indicate that codling moth damage did not increase through February and early March. Trap catches have been low, but given earlier signs of low level damage, we supplemented pheromone mating disruption with a light program of Fenoxycarb through January and February and this seems to have kept the moth in check. Mites – We sustained some leaf bronzing in a couple of blocks as we allowed % leaves infested to reach 80-85% leaves infested with predator levels at around 30% leaves occupied. In hindsight, we may have avoided some of this leaf bronzing by intervening with a miticide earlier when mite levels were at around 70% leaves infested. Figure 2. Leaf bronzing due to Two Spotted Mite infestation on Gala apple leaves. Next season, if needed, a miticide will be applied slightly earlier (at say 70% leaves infested rather than 85%) in an attempt to avoid foliage damage, but still encourage predatory mites. WAA – Still planning to collect some shoots with parasitised WAA and coolstore for release next Spring. Our challenge now is to determine the best time to collect the shoots, so we’ll be checking the level of parasitism and will try to collect before we see too many wasp exit holes. To avoid damage in our hotspots next season, we are considering the option of spot spraying these areas with a single WAA insecticide in Mid Spring. This seemed to work well in our older Fuji blocks this year and A.mali did re-establish very well in these areas. CM – No major changes planned for CM program next season. Reasonably happy with end result this season. Will continue to monitor traps and fruit. Mites – If necessary, we’ll probably intervene with a miticide at a lower infestation level next season, to avoid leaf damage but still give predators an opportunity to build-up. Nothing outstanding this month. It was good to see that the WAA hotspots did not increase in area. IPDM approach has continued to yield benefits for us this season.